Dermaplaning is a simple and safe procedure for exfoliating the epidermis and removing the fine vellus hair (peach fuzz). Removing epidermal skin also allows products to penetrate more readily into the deeper layers of the skin. This treatment is very effective to prepare the skin for medical procedures such as laser treatments, deep/superficial chemical peels or Meso ME. This is a great treatment for clients who are pregnant or nursing who want a deep exfoliation, but are not allowed to use peeling agents on their skin. It is also a first choice for clients who have excess vellus hair on the skin. This hair often causes a build-up of dirt and oils in the follicles, so removing the hair gives the patient healthier looking skin. Although merely an old wives’ tale, many clients are often concerned that the hair will grow back heavier and darker after Dermaplaning. This is not the case. As long as the hair is superficial vellus hair, it will grow back at the same rate and texture as before the treatment. Dermaplaning is most often used on clients with rough, dry skin, mild acne scarring, or fine lines and wrinkles. The treatment results in a more refined, smooth, “glowing” appearance. 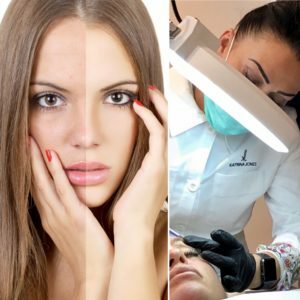 Dermaplaning in Sawbridgeworth, Hertfordshire and are with 30 mins drive of Bishops Stortford, Epping, Sheering, Harlow, Hatfield Heath, Hatfield Broad Oak, Birchanger, Takeley, Stansted Mountfitchet, Manuden, Fyfield, Elsenham, Hoddesdon, Furneux Pelham, High Easter, Henham, Chipping Ongar, Hertford, Widdington, Clavering,Theydon Bois and other surround towns in Essex, Herts and London.